As medical and scientific breakthroughs lead physicians to a deeper understanding of human health, personal knowledge of the different body systems, their functions, and the myriad issues confronting them is becoming increasingly important. The Facts On File Encyclopedia of Health and Medicine is a comprehensive, four-volume reference that is perfect for a wide audience—from students to health professionals to lay readers—looking for reliable, accurate, and accessible health information. 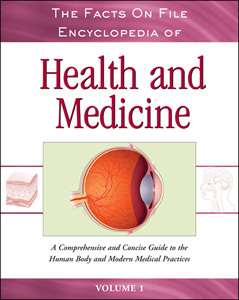 Under the direction of a medical advisory review panel, this authoritative work features contributions from a diverse group of medical professionals—including psychologists, dermatologists, pulmonary and critical care specialists, gynecologists, cardiologists, ophthalmologists, gastroenterologists, and many others. The wide range of topics spans from infancy to old age, and the coverage is sensitive to differences between genders and ethnic groups. Body systems are covered in individual sections in Volume 1 through Volume 3, with general health information in Volume 4. Each section is organized A to Z and provides an overview, discussing history, research, and breakthroughs. All four volumes are extensively cross-referenced (both within the volume and with the other volumes). Each volume includes an index, and the index in Volume 4 includes entries for all four volumes. Volume 4 also includes several appendixes and lists of helpful resources. Appendixes: Vital Signs; Advance Directives; Glossary of Medical Terms; Abbreviations and Symbols; Medical Specialties and Allied Health Fields; Concise Notable Biographies; Modern Medicine Timeline; Resources; and others. Alexa Fleckenstein, M.D., is board certified in Internal Medicine and currently practices integrative medicine at Whole Health New England in Arlington, MA. Gary R. McClain, Ph.D., is a psychologist, counselor, and consultant in New York City, with 25 years of experience as a mental health professional and in the business world. The focus of his practice is healthcare and wellness. Maureen Ann Mooney, M.D., is a clinical, surgical, and cosmetic dermatologist currently in private practice in Puyallup, WA. Dr. Mooney is trained to perform Mohs’ Micrographic Surgery. Margaret J. Neff, M.D., M.Sc., is assistant professor of medicine in the Division of Pulmonary and Critical Care at the University of Washington School of Medicine, Seattle, WA. Maureen Pelletier, M.D., C.C.N., F.A.C.O.G., is a board-certified obstetrician/gynecologist and clinical nutritionist who is also licensed as a medical acupuncturist. Dr. Pelletier is in private practice in Cincinnati, OH. Otelio S. Randall, M.D., is Director of the Preventive Cardiology/Hypertension Program at Howard University in Washington, DC, and serves as Program Director of Howard’s General Clinical Research Center. Susan D. Reed, M.D., M.P.H., is associate professor in the Department of Obstetrics and Gynecology and adjunct associate professor in the Department of Epidemiology at the University of Washington School of Medicine. Jerry Richard Shields, M.D., is an ophthalmologist in private practice in Bothell, WA. Christina M. Surawicz, M.D., is Section Chief of Gastroenterology at the Harborview Medical Center and Professor of Medicine/Assistant Dean for Faculty Development at the University of Washington School of Medicine. Denise L. Wych, R.N., CM-C, is a cardiac nurse case manager at Palmetto Health-Richland Heart Hospital in Columbia, SC. "...the information is accurate and the book does a wonderful job of taking into account its readers’ health information literacy..."
"...a good choice for libraries..."
"...will provide much valuable information for student researchers who consult it." "The strength of this source is the presentation of information...offers a good introduction and overview to the topics addressed..."
"...fulfills its goal of providing medical information in a clear, concise format; the nicely written articles are straightforward and unbiased...recommended for public and high school libraries."